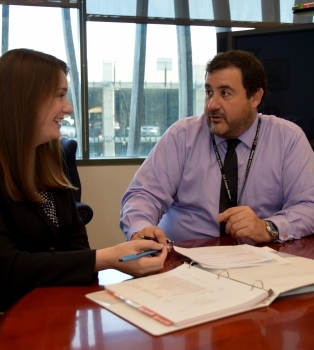 The Improving Operational Efficiency (IOE) program at the U.S. Census Bureau harvests ideas from employees and brings cost saving and efficiency-improving innovation to executive staff for possible investment. The program has invested in 109 projects in the last three years and saved more than $32 million. I am currently revamping the program to streamline and improve metrics, objectives, performance and the harvesting of ideas. There are several overarching themes within my current responsibilities that relate to the President’s blueprint for America — innovation, efficiency, saving money, avoiding costs, streamlining processes, and creating projects that add strategic value to the organization. By spurring innovation and improving operational efficiency, my program helps government run more efficiently and do more with less. In my varied career since joining the Department of Commerce in 1998, I have worked in five of the Census Bureau’s12 regional offices as well as the headquarters building in Suitland, Md. My previous position — director of the Dallas Regional Office — was the most challenging, as at the peak of operations during the 2010 Census, it had 111,000 employees in 51 local census offices. I led the enumeration of more than 33 million people while dealing with 45 congressional districts and four of the 10 most populous cities in the country. I was born in Uruguay and immigrated to the United States at the age of eight. I was raised in New York City, but I have been fortunate to live in various places around the country, which helped ratchet down the big city experience. I was very proud of my heritage when I became the first-ever foreign-born regional director of the Census Bureau. Still, I keep searching for another Uruguayan in the Commerce Department.